(Roman mythology) Roman goddess of the dawn; equivalent of the Greek Eos. Sister of Luna and Sol. A female given name, in quiet but regular use since the 19th century. (astronomy) 94 Aurora, a main belt asteroid. A town in Ontario, Canada. A city in Nebraska, and the county seat of Hamilton County. A town in Erie County, New York. A ghost town in Nevada. A CDP in West Virginia. One of two towns/villages in Wisconsin. A town in Western Cape, South Africa. (historical) The island of Maewo. (historical) The island of Makatea. How will they know! Why, my name is all over them: my silly, unhappy name. Oh, if I had only been christened Mary Jane, or Gladys, Muriel, or Beatrice, or Francesca, or Guinevere, or something quite common. But Aurora! Aurora! I'm the only Aurora in London; and everybody knows it. I believe I'm the only Aurora in the world. And it's so horribly easy to rhyme to it! Named after Aurora Quezon, wife of former Philippine president Manuel L. Quezon. - Sinä valaiset tämän salin kuin aamurusko, Walleen kiittelee Auroraa viikset mielihyvästä väpättäen. - Aamurusko nimensä mukaan, totisesti, hän jatkaa vaimolleen matalasti. 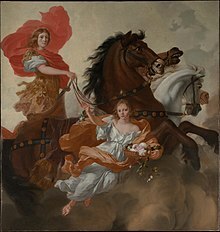 (Roman mythology) Aurora, the goddess of the dawn/morning.